Korean Braised Chicken Thighs use the most flavorful and budget-friendly part of the chicken for a dish you’ll crave again and again! 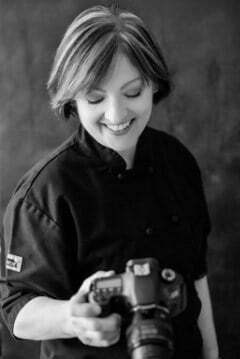 I am crazy in love with Korean flavors ever since I published my Korean Braised Beef Short Ribs recipe. Those short ribs have the amazing flavors of ginger, garlic, soy sauce, brown sugar and gochujang. Wait. You haven’t heard about gochujang yet? This ingredient is referred to as the “new” Sriracha. I call it umami in a jar! It’s a savory, spicy, slightly sweet, fermented Korean condiment made from red chiles, rice, soybeans and salt. When gochujang first hit the scene, I had a difficult time finding it. Now I see it almost everywhere including the international aisle at my local grocery store. 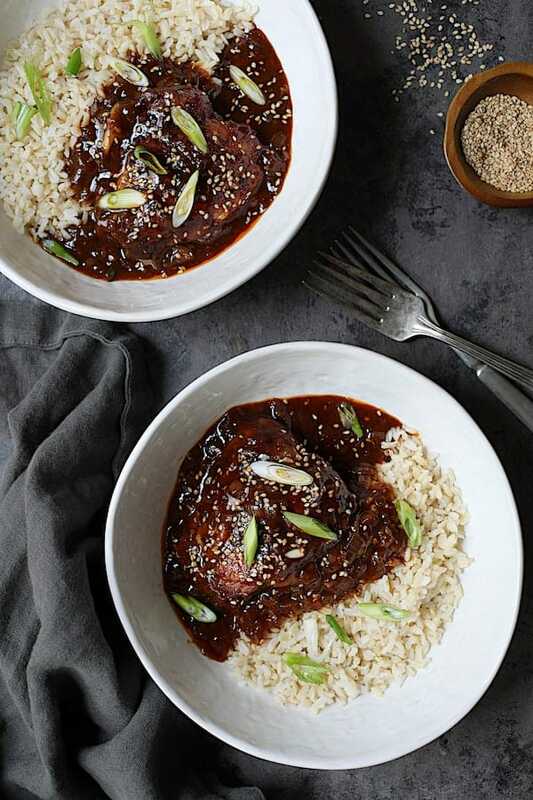 The best thing about Korean Braised Chicken Thighs is you get a ton of flavor in less time than from braising beef short ribs. Yay! And, if you keep a well-stocked Asian pantry full of ingredients such as soy sauce, sesame oil, mirin, you’ll be able to create any Asian-inspired dish on the fly rather than doing take-out. Start with bone-in, skin-on chicken thighs. Brown in oil in a cast iron skillet until the skin is nicely browned then move it off to the side onto a plate. Then add the amazing sauce combination of chicken broth, soy sauce, gochujang, sesame oil, mirin, ginger, garlic…. Simmer, turning a few times until thoroughly cooked through then…. 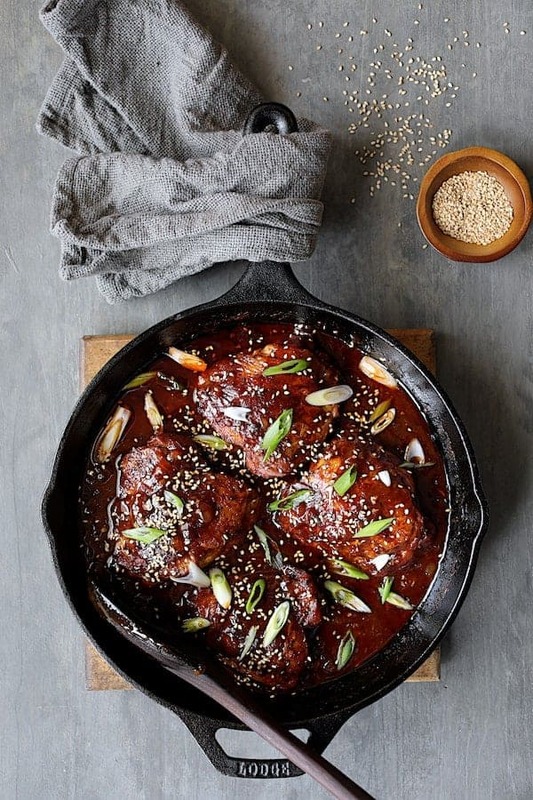 There’s some amazing sauce happening around these Korean Braised Chicken Thighs! 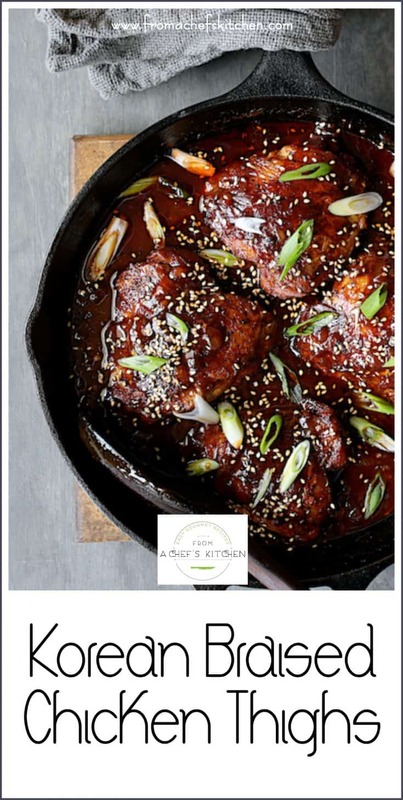 Tender, intensely flavorful Korean Braised Chicken Thighs! Meet your new favorite dinner! You’ll never crave take-out again! 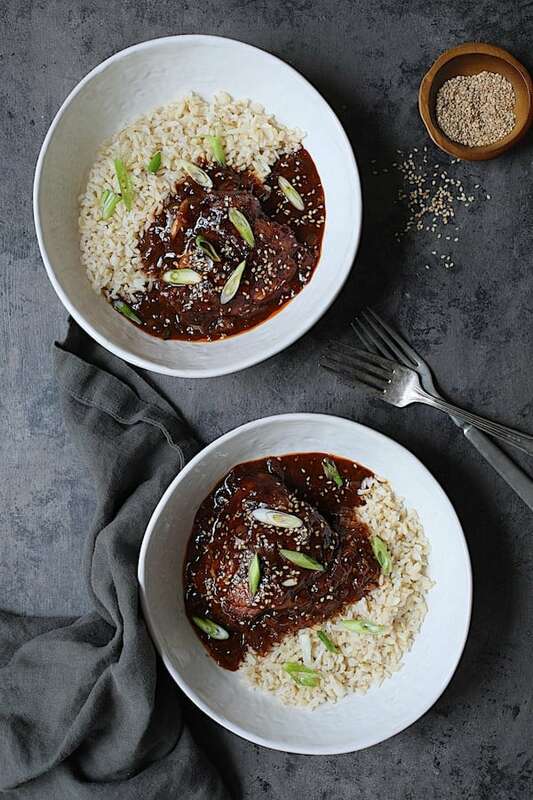 Korean Braised Chicken Thighs use the most flavorful and budget-friendly part of the chicken for a dish you'll crave again and again! Whisk together first 7 ingredients: Garlic, ginger, chicken broth, soy sauce, gochujang, mirin and sesame oil. Set aside. Heat oil over medium-high heat in a cast iron or other heavy skillet until shimmering. Season chicken thighs with salt and black pepper. 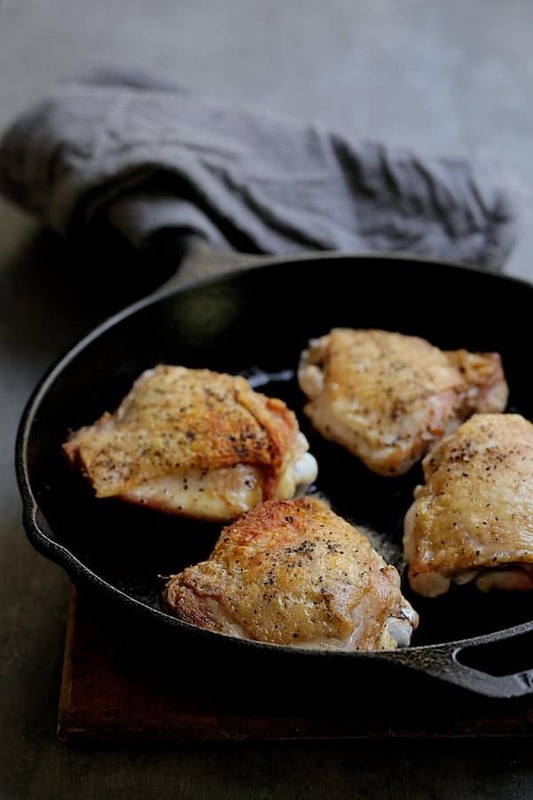 Place chicken thighs in skillet, skin side down and cook 4-5 minutes or until skin is nicely browned. Transfer to a plate. Refresh oil if needed. Add the onion, reduce heat to medium-low and cook 5-6 minutes or until onion is beginning to soften. 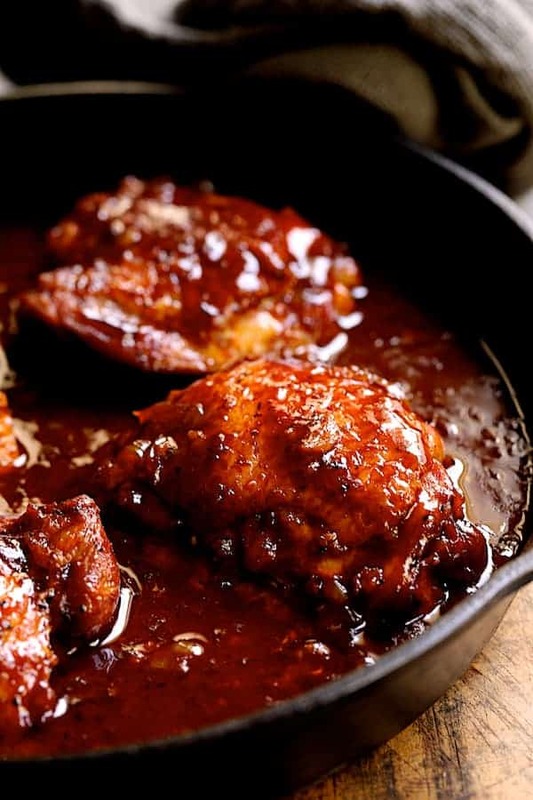 Return chicken thighs to skillet along with sauce combination. Bring to a boil. Reduce heat to medium-low and simmer 25-30 minutes or until chicken thighs are thoroughly cooked through and tender. Using a ladle, transfer some of the liquid to a small bowl and whisk in the cornstarch. Pour into the skillet and continue simmering 2-3 minutes or until thickened. Serve, garnished with sesame seeds and thinly sliced scallion and cooked brown rice. LABOR-SAVING TIP: Transfer the sauce mixture to the same bowl you used to mix up the sauce. 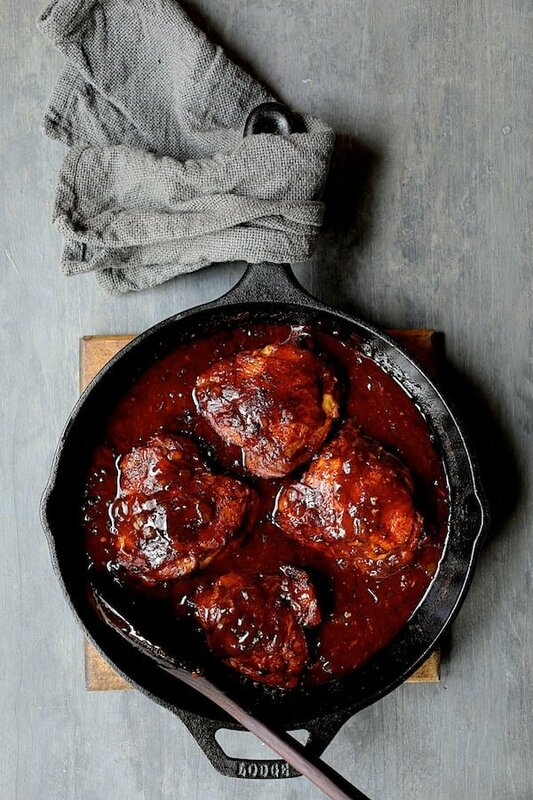 I always have gochujang in the fridge and I can see these chicken thighs making an appearance in our kitchen soon. I’ve pinned. Thanks, Karen! Gochujang is something I always have in the fridge now, too! It’s sooo good! Made these tonight but finished them in the oven! Delicious! I am a new lover of gochujang sauce!! Thanks so much, Jaime! So glad you enjoyed! I know about the gochujang–it is positively addictive! Thanks again!